January Fine Dining in Torrevieja – The Weather for Soups! It’s that time of year again. Christmas and New Year have been and gone, and here on the Costa Blanca we know the weather is about to turn positively chilly. Hopefully we won’t have a repeat of last year’s snow (the first in around 90 years). In the restaurant kitchen, it’s time to turn our attention to the traditional winter warmer – hearty homemade soups are on the menu big style. 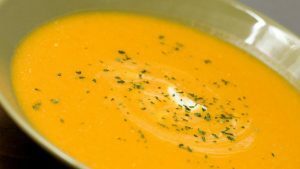 Here are a few of our secrets of how to make soup, and why they are rated so highly by reviewers of Torrevieja’s best restaurants. With any soup, the stock you use is the most important ingredient. If it’s substandard, your soup will be too. Vegetable stock is one of the easiest things to make in the kitchen. Basically, chop up your vegetables, cover with water, and simmer. Forget adding salt or pepper. Seasoning always comes last when making soup, as I explain below. Chicken stock is a little more involved, but still easy to make – and a great way to use all of your chicken. A great way to add flavour to your soup is to sweat or roast the vegetables first. Don’t simply chop everything up and sling it all in. Onion, garlic, carrots and celery are great flavour enhancers, especially when they are sautéed in butter first. They should be cooked just long enough to soften before using them in your soup. It’s important to get your timings right when adding ingredients. Peas cook faster than carrots. Stagger your preparation times to make sure that your ingredients complete their cooking process as close as possible. When it comes to soups and vegetables, size matters. Hearty rustic soups should have bite-sized chunks. But if you are creating a soup with, say, spinach or kale, these types of vegetables need to be chopped finely, to release the flavour without being difficult to eat. 5.Slow down! And then slow down again! With all your ingredients added to the stock, bring your soup to the boil. Then slow the whole process down to a simmer. And relax. Slow it down again. Whatever you do, you can’t rush a good soup. Boil it too quickly, and you’ll serve up a mush with tough, chewy meat. So slow down, and then slow down some more. Take your time. Read a book. Or use the time to cook a perfect pie. You might like to add cream or milk to help thicken the soup, and give it a little extra ‘oomph’. Don’t make a soup any thicker than the consistency of whipping cream. If you do, it should probably be spread on bread and served as a sandwich! Always warm your cream or milk before adding to a simmering soup. Milk will curdle if it is added cold. And take care not to bring to the boil after adding milk – it won’t work out very well. The amount of seasoning required depends upon the ingredients you use. And even then, the amount of sodium in the mix can differ. Always season your soup at the end of the cooking process, and even then, do so sparingly. Make sure you taste as you season. Here at Christopher’s, we always err on the side of caution when seasoning soup. Every taste bud is different. Diners can add salt and pepper to taste if they wish. It’s not quite so easy to take too much salt out of a soup! Of course, you could always come and enjoy a bowl of homemade soup here at Christopher’s. We have two soups on the menu each day. Accompanied by crusty bread, they are regular favourites throughout the year. And sell-outs during January and February. Join us for lunch or dinner. Eat à la carte or from our special set and varied menus. And enjoy a homemade soup that will warm you right through. To reserve your table, call us on (+34) 600 01 28 24 to book your table and enjoy a cracking New Year’s Eve at one of Torrevieja’s top 10 restaurants (as rated by diners on www.tripadvisor.com).